MLSS divers, Glen Dennison and Viviana Lee, recovered and replaced the temperature logger installed for long-term monitoring on the artificial reef, HMCS Annapolis, in Halkett Bay. The logger is mounted on the ship at a depth of 23 m (75 ft) with this period of data extending from August 6, 2016 to May 7, 2017. Specialist sponge diver instructor, Viviana Lee handled the logger change over with ease. Conditions were sunny, but with a heavy plankton bloom limiting underwater visibility. Data is shared with the ARSBC and Vancouver Aquarium regarding the collaborative ABIS project (Annapolis Biodiversity Index Study. Check out the results of this survey! 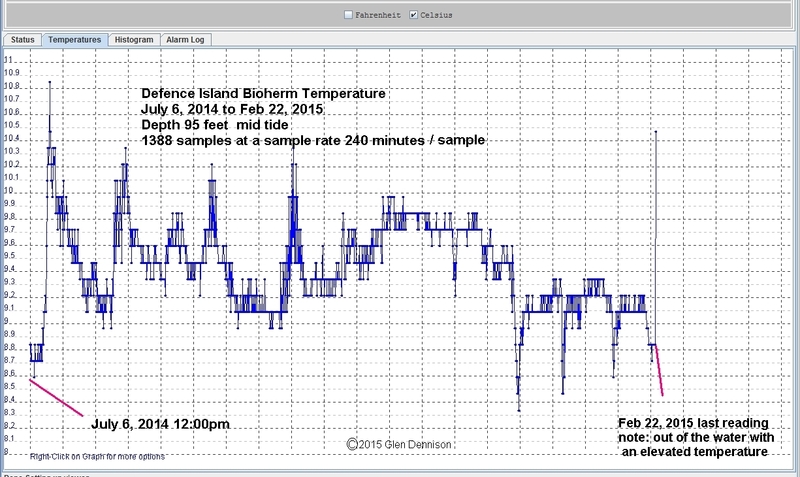 The Halkett Bay temperature logger was removed today. The logger was on site for eight months collecting continuous data. initial installation. Next recovery will likely be in the early summer of 2017.
sighted; as well as a large number of perch schooling around the wreck. Laura Borden, a researcher at the Vancouver Aquarium, has compiled the data collected in 2015 from the seven temperature loggers placed throughout five Howe Sound bioherms. Interestingly, we can see tidal influences occurring at depth within the bioherms in these graphs. Thank you, Laura for pulling together these graphs. The dive team of Scott Meixner, Julian Goss, Kim Ansell and Cam Jackson, recovered and reinstalled the Lost Reef bioherm temperature logger. The underwater visibility was approaching 45 feet and ocean current were low making for good diving conditions. The maximum depths of the divers was about 110 feet, with above average nature lighting conditions on the sponge. After downloading the temperature data we found similar large rises in deep ocean temperature in the Lost Reef bioherm as observed at the Halkett bioherm. An MLSS dive team recovered and replaced the Halkett reef sponge bed, thermochron logger. Note the two large temperature spikes in the data at the end of the graph. On casual observations, the sponge bed did look healthy and seemed to be thriving. There was a large concentration of rockfish above the sponge, consisting of Quillback, Copper, and Puget Sound rockfish in small schools. Also present were Kelp Greenling and Lingcod. Visibility was running at about 50 feet and divers swam to the north end of the sponge bioherm, depth 110 ft, on a 4.5 ft rising tide. 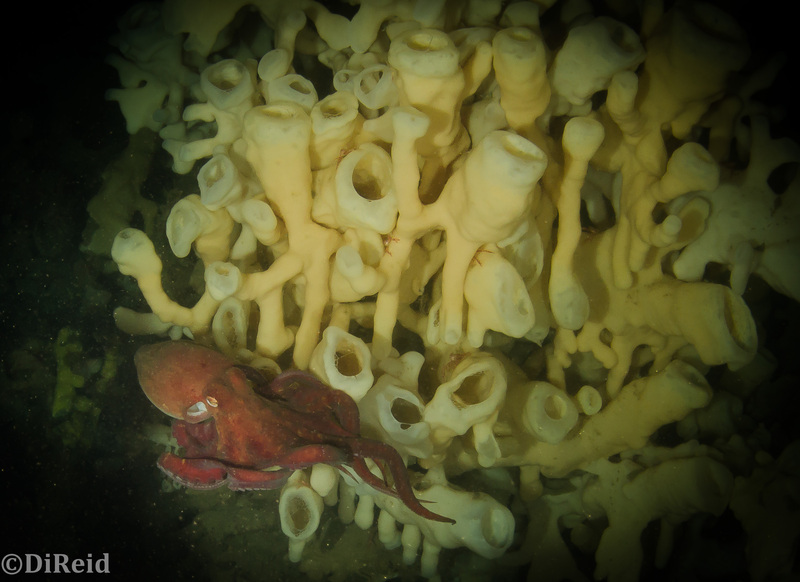 A rare sighting of an Octopus on the Lost Reef sponge bioherm. The dive team of Dave Park, Diane Reid, Jessica Schultz and Glen Dennison, with Alex Askew on the helm, recovered and replanted the temperature logger on the west side of the Lost Reef bioherm. Diver Dave Park ascended with the instrument for a successful data download (see graph). The dive team of Dave Park, Scott Meixner, Paul Sim, and Roy Mulder dropped onto the Defence Island pinnacle bioherm and recovered the temperature logger installed there. Alex Askew ran the helm up top. Conditions where favorable for the advanced dive into the sponge beds. It was an impressive dive, with glass sponge beds on one side and seawhip forests on the other. This project is ongoing at 5 different sites in Howe Sound. The process of data recovery will continue over the next 5 years to collect continuous time series of temperature data. Future data analysis will examine relationships between bottom temperature and other physical data (e.g. surface temperature, flow rates, sponge growth rates, and live sponge coverage) in collaboration with the Vancouver Aquarium and academic partnerships. 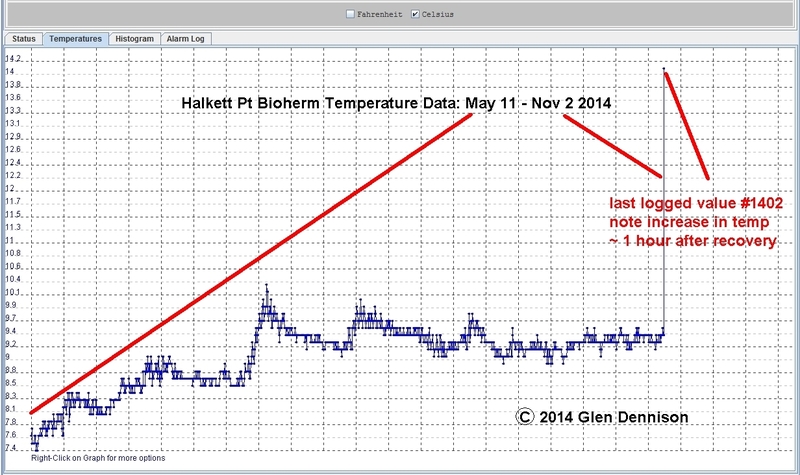 On November 2, 2014, the first long term temperature measurements were recovered from the Halkett Deep Reef bioherm. 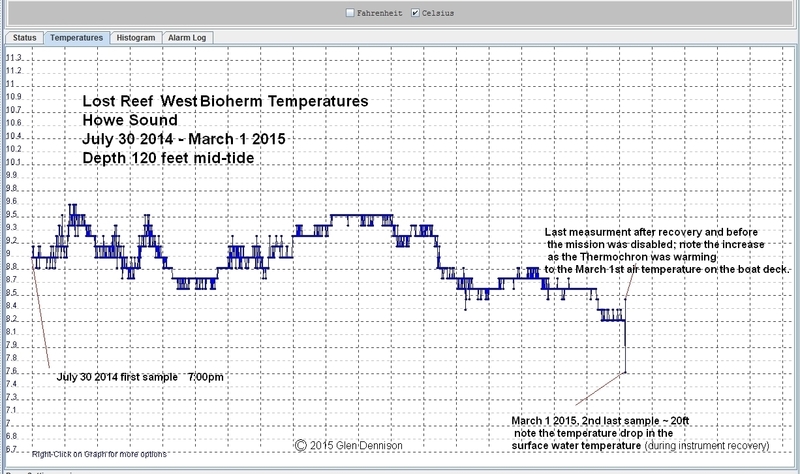 The data logger was recovered, downloaded, and a new unit was installed to continue logging temperature data. To date, 1402 individual data points have been recorded and stored, from May 11 to Nov 2, 2014. 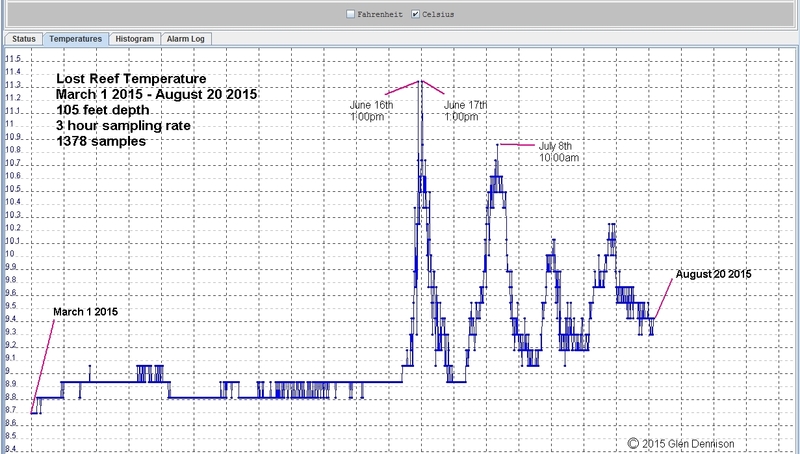 Temperature was continuously recorded every 3 hours, time stamped and saved. Future data analysis will examine relationships between bottom temperature and other physical data (e.g. surface temperature, flow rates, sponge growth rates, and live sponge coverage) in collaboration with the Vancouver Aquarium and academic partnerships. 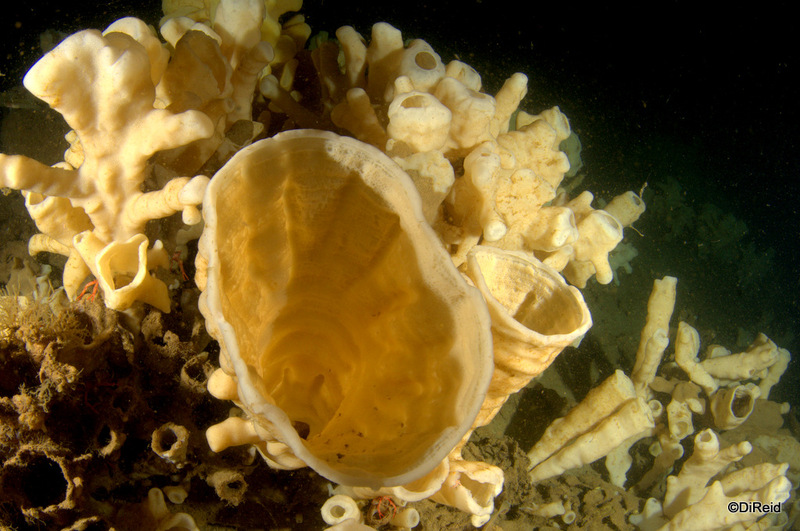 The dive team of Roy Mulder, Diane Reid, Hilary Curry, and Glen Dennison dropped into the Halkett glass sponge bioherm to recover and then install the logger at a depth of 100 feet. Surface support was provided by Alex Askew and Dave Park. This process of data recovery will continue on in 2015 with 5 more logging units to be retrieved and downloaded from 4 more sites. The project will span 5 years of continuous measurements.